The first chief rabbi of Albania was inaugurated in Tirana last week in the presence of a representative of Albanian Prime Minister Sali Berisha and Chief Rabbi of Israel Shlomo Amar. Prime Minister Berisha had expected to attend but because of the floods in Albania, he sent his representative with a blessing and greeting to the new chief rabbi and the Jewish community. The inauguration is the result of a meeting a number of months ago between Prime Minister Berisha and the Rabbinical Centre of Europe (RCE) in the RCE’s offices in Brussels. The RCE is an organization dedicated to meeting the needs of Jewish communities in Europe. During the meeting, the representatives of the RCE thanked Berisha for his efforts and expressed their gratitude for the great support and assistance that the Albanians have made for the Jewish community through sheltering and saving many Jews during the Holocaust. The RCE broached the subject of appointing Rabbi Joel Kaplan, who is affiliated with the RCE, as the first Chief Rabbi of Albania. Berisha consented to the idea. The ceremony, including the traditional agreement between a community and its new chief rabbi, was presided over by Rabbi Aryeh Goldberg, Deputy Director of the RCE and Rabbi Gershon Mendel Garelik, Head of the Rabbinical Court in Milano and founder of the RCE. The event was also attended by representatives from the Albanian Christian and Muslim communities. During the RCE’s visit to Tirana, a Jewish center called "Moshe Rabenu" and a synagogue named after the visiting Chief Rabbi of Israel was inaugurated as "Hechal Shlomo". Rabbi Kaplan will now preside over a reinvigorated Jewish community. “This will be the first time in 70 years that there will be a minyan (Jewish prayer quorum) in Albania,” Rabbi Kaplan said. The rabbi’s first task will be to import kosher food into Albania and he will enjoy diplomatic status. Rabbi Kaplan, formerly the Chabad emissary to Thessaloniki in Greece, had approached the RCE with the idea of reinvigorating the small Albanian Jewish community. The number of Jews in Albania is thought to be around 150, although these numbers are buttressed by large numbers of Jewish tourists and businessmen who visit the small nation. Albanian Jewry dates back over 1,300 years, but was at its peak after many Jews expelled from the Iberian Peninsula made it their home. During the Communist era, the Socialist People's Republic of Albania banned all religions, including Judaism. After the fall of Communism in 1991, all but a small number of Albanian Jews moved to Israel. 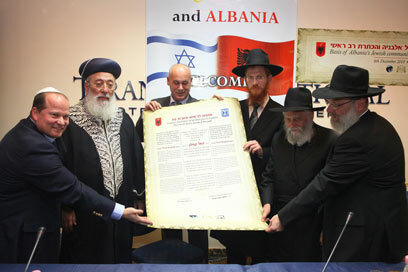 See all talkbacks "1st chief rabbi inaugurated in Albania"